Tommy (Óscar Martín) is a young boy who lives out in a cabin with his mom Molly (Concha Cuetos) and the garbage human he calls his uncle. Tommy finds a cave filled with pink light and steals a giant egg from it. The egg hatches and a little tube-nosed monster is born. Tommy names the thing Trumpy and tries to make friends with it. Meanwhile, Trumpy’s parent is none too happy about some poachers smashing up all the other eggs and decides to starts busting some heads. There is also a really terrible band on vacation that gets caught up in this mess, but the less said about them the better. "Got any Plutonian Nyborg, man?" It should be no surprise that the man who gave us Pieces (1982) directs this film, it certainly shares that film’s complete disregard for tone, placing horror next to whimsical moments. While Pieces is a freewheeling gorefest, Extra Terrestrial Visitors is much more restrained. I can understand the producers wanting to cash-in on E.T. by cutesifying their own aliens, but I can't figure out why they still made them murder machines. Why the Little Dipper, easily the least scary constellation of all time, appears on the victims' foreheads is anyone's guess. The aliens look supremely goofy and out of place in the moody damp woods where most of the movie is set. Everyone in this film deserves accolades for managing to not only keep a straight face every time one of the creatures is on screen but actually act as if it were a horrifying threat. Remove the aliens from this movie and you actually have something that feels like it had the potential to be decent if overdone stalk and slash horror film, but with the creatures included, you have something that is memorably absurd. "So you're the reason the shower drain is clogged so badly." I have a difficult time judging the actors in a film that is dubbed. I will say this much, most of the acting seems passable, but the dubbed voice of Tommy is one of the most irritating sounds imaginable. Viewing can be sheer agony since Tommy has so much screen time with the mute Trumpy. One of my early theories about this movie was that not only was it drawing from E.T., but there was a healthy attempt to cash in on the television show ALF. 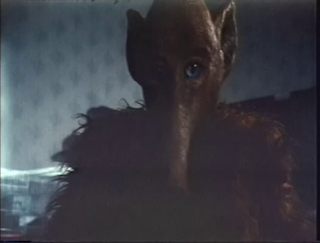 Trumpy and its parent have the same basic color, furry body, and a long snout. The difference is one eats cats and the other kills crappy band members. So, I was a little surprised to find that Extra Terrestrial Visitors pre-dates ALF by three years. Extra Terrestrial Visitors does feature a kitten in a few scenes, but the cat goes mostly unmolested. Is it possible that the creators of ALF caught a screening of Extra Terrestrial Visitors somewhere and were inspired? A true mystery from the stars.